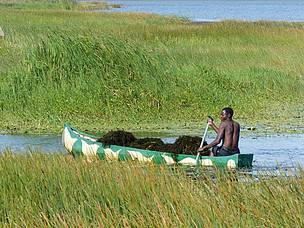 The area of wetlands designated for protection and sustainable management under the Ramsar Convention, with WWF’s support, has reached 100 million hectares worldwide, with the declaration of Zimbabwe’s ﬁrst seven Ramsar sites. The area of wetlands designated for protection and sustainable management under the Ramsar Convention, with WWF’s support, has reached 100 million hectares worldwide, with the declaration of Zimbabwe’s ﬁrst seven Ramsar sites. This milestone, announced on World Wetlands Day, 2 February, means WWF has supported 45 per cent of the 215 million hectares of Ramsar wetlands designated since the convention was signed in 1971. The new sites in Zimbabwe include the iconic Victoria Falls. Wetlands are among the most biologically diverse ecosystems and also provide key functions such as water puriﬁcation and stabilization of water ﬂows during ﬂoods and drought – yet more than 70 per cent of the world’s wetlands have been lost in the last century. Protection and restoration of wetlands remains a WWF priority due to their conservation importance and role in supporting sustainable development.